Andrew and I returned home on Saturday after two truly wonderful weeks in Turkey. Before this trip, we hadn't taken a trip together that was longer than 4 days in the last several years (including our honeymoon, or "minimoon" as I like to call it). So we knew that we had to do something special during my time off after graduation! 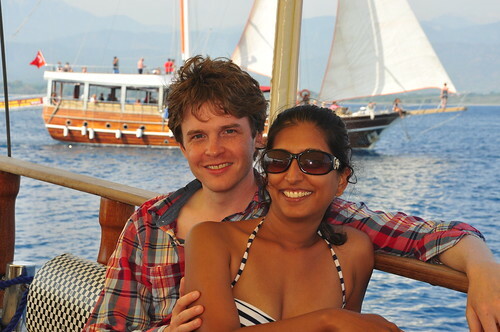 We spent 5 days in Istanbul, saw the ruins at Ephesus, then spent some time on the coast in Fethiye and Antalya. I still can't get over how warm the water in the Mediterranean is! Of course, the food was a big highlight of the trip. We ate freshly caught fish, grilled and dressed with nothing but a squeeze of lemon, accompanied by Turkey's national drink, raki (anise-flavored liquor). We tried countless versions of kebabs, and enjoyed one particularly memorable meal of pide (Turkish pizza). We loved the Turkish breakfast that we had every day - bread, fresh cheese, tomatoes, cucumbers, olives, fruit, yogurt, eggs, served with honey, butter, and jam. In the afternoons, we often stopped to re-energize with a Turkish coffee. We indulged in sweets - Turkish delights and baklava - and fast food too, like fried mussels and doner (meat cooked on a spit) sandwiches. We saw fruit trees everywhere, and ate fresh oranges, apricots, peaches, watermelon, and cherries. Personally, there were two aspects of the cuisine that I found very inspiring - mezes and yogurt. Mezes are small plate dishes, usually served as starters, and they are often vegetable-based and served cold. The main dishes were heavy on the meat, so I got most of my vegetables through the mezes. Even the most simple ones, like green beans in olive oil, were delicious, and I loved trying a sampling of what each restaurant had to offer. You can count on seeing a number of meze recipes appear on the blog this summer, using plenty of local produce. As for yogurt, it was great to see the number of ways that it was used - mixed with vegetables or herbs in mezes, served alongside tomato sauce on top of sliced meat and bread, and used as a sauce for stuffed pasta - all so good! I love yogurt, and I am definitely going to expand the number of ways that I use it now. The recipe that I am sharing with you today is a meze that includes yogurt. I found a great blog of Turkish recipes and I made a variation of a zucchini-walnut dip I found there. I'm not really sure if what I made counts as traditional Turkish, so I'm just calling it Turkish-inspired. It's great served with pita or other bread, especially when it's hot out! Heat 2 tbs olive oil in a medium saucepan over medium heat. Add zucchini and a pinch of salt and saute for 7-8 minutes, until zucchini is tender and has released most of its water. Let zucchini cool, then drain and squeeze out excess water. While zucchini cooks, mince garlic. Sprinkle salt (preferably kosher salt) over the garlic and mash garlic into a paste (you can press your knife blade at an angle on the garlic to do this, or use a mortar and pestle). When zucchini is cool, stir together zucchini, yogurt, garlic, and 1/4 cup pistachios until well combined. 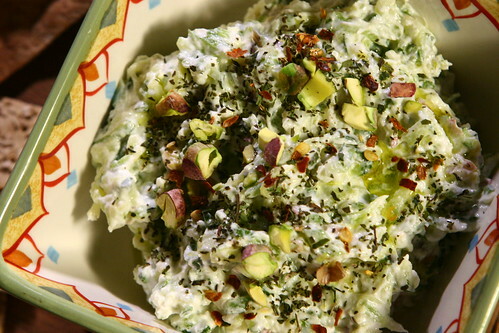 Just before serving, drizzle dip with extra-virgin olive oil, and sprinkle with pistachios, dried mint, and dried chile flakes. 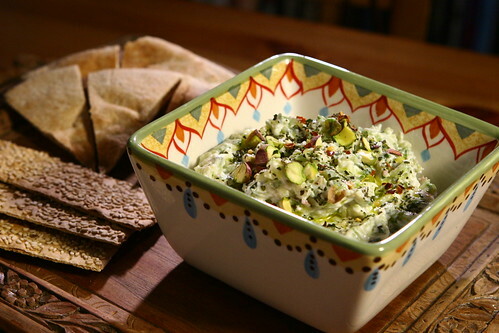 Serve with pita, bread, or crackers. Oh, wow! What a wonderful trip and experience! All the food sounds great and this dip looks yummy. I love getting to explore new foods like that. Sounds like such an amazing trip! And the food sounds amazing to - especially your dip! I've been looking for more ideas of what to do with all this zucchini I have - this looks perfect! what a fabulous trip, especially the food :) this dip looks awesome too, and perfect in the summer, definitely giving it a try!